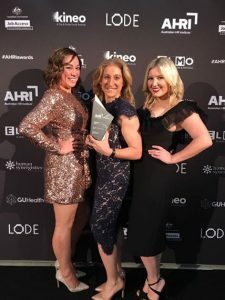 International Convention Centre Sydney (ICC Sydney) has taken home the Marshall Goldsmith Talent Development Award at the Australian HR Institute (AHRI) Awards overnight. Presented in Melbourne, the award recognised ICC Sydney’s commitment to ensuring its 1,700 team members are best prepared for success, creating careers, not just jobs, for those working in the events and hospitality industry. CEO of ICC Sydney, Geoff Donaghy said the award was testament to the team for their commitment and dedication in providing opportunities for team members to grow and develop. “As we near our two year anniversary, the award highlights the successes of ICC Sydney not only in developing a team with a strong culture for delivering excellences with a warm smile but in nurturing their growth and success within our business,” Donaghy said. NSW Minister for Finance, Services and Property, Victor Dominello said that despite opening its doors less than two years ago ICC Sydney had already won a plethora of prestigious awards. “This award nomination demonstrates that ICC Sydney is not just a great function venue but also a great place to work,” Dominello said. Director of Human Resources at ICC Sydney, Mathew Paine said the continuous learning opportunities provided by ICC Sydney was evident in its success. “Every day our team members are responsible for delivering extraordinary experiences for every guest who walks through our doors. The skills and knowledge development available to our team members is something we are incredibly proud to offer of our people. ICC Sydney has always had a bold vision to be a true employer of choice and great place to work, providing long term careers and development opportunities”, Paine said.